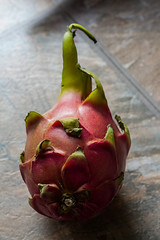 I'm sure you might have heard of dragon fruit but it is likely you've never tried it. Well I took the plunge this weekend and I have to say: get on it! I first saw dragon fruit in a stupid facebook game. I honestly have never seen it in real life until until this weekend when I visited by my local Super 88, and Asian supermarket. It isn't that expensive, was easy to cut and prepare, and I hear it makes a for a great smoothie ingredient. The actual fruit itself is soft almost like a pear mixed with a watermelon, and it tastes a bit like kiwi. 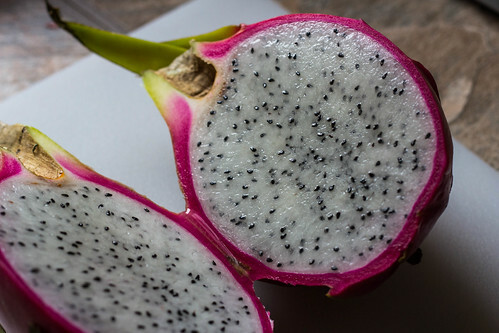 Dragon fruit only got its name from Asian countries like China and Vietnam. It is actaly native to Mexico, Central America, and South America. Dragon fruit is a type of cactus. The plant looks crazy! Dragon fruit is rich in carbohydrates, protein, calcium, iron and phosphorus. It also provides large amounts of niacin (vitamin B3) and ascorbic acid (vitamin C). The fruit is rich in water and fiber, and contains significant quantities of phytaolbumin antioxidants, which prevent formation of cancer-causing free radicals. I'm definitely going to buy some more, and I suggest you give it a shot too.